Multi-photon microscopy (MPM) is a powerful technique that allows three dimensional mapping of samples that have a measurable nonlinear optical response such as second harmonic generation (SHG), third harmonic generation (THG) or fluorescence induced by multiphoton absorption. MPM provides us with a way to see the nonlinear microscopic world with high resolution, in 3D. After about two decades of intensive development MPM has found important applications in nonlinear materials characterization, biological research and in diagnosing medical conditions. Immersion participants will learn how to build a compact multiphoton microscope using a femtosecond fiber laser as the excitation source. Different nonlinear optical contrast mechanisms will be introduced. The optical and mechanical design of the microscope will be discussed. Participants will assemble the microscope from scratch, perform alignment, and acquire multiphoton images from various samples including biological tissues. (a) Schematic diagram of the multi-photon microscope. (b) Photograph of the microscope. Examples of a multiphoton images are shown in (c) the end of a mosquito needle and (d) a full cross-section of a mouse brain. Click on the image to see a larger image. A fuller description of the apparatus appears below. The most important application of MPM is in biological research and diseases diagnosis. Imaging technology has and will continue to influence medicine by advancing research and development (R&D) based on mechanistic insights into biomedical processes that ultimately lead to innovative pharmaceuticals, diagnostics to better plan treatment, and clinical management of diseases to improve outcomes. Immersion participants will learn about a couple of ongoing research efforts such as brain and cancer imaging. Nonlinear material and device characterization is another interesting application where MPM can play an important role. If time allows, participants will have a chance to image some interesting 2D materials such as graphene with the multiphoton microscope. The microscope can also be used for 3D writing which is an important emerging technique for creating advanced optical and medical components. Skills that will be acquired during this Immersion include optical design and alignment, data acquisition and processing, and familiarity with multiphoton microscopy. Participants will learn the design and construction of a multiphoton microscope along with all the required data acquisition and signal processing steps. A special nonlinear knife-edge technique will be applied to measure the resolution of the microscope in the x, y and z directions. Different nonlinear optical effects will be investigated to create an image including SHG, THG and multiphoton excitation fluorescence. In particular, three-photon excitation fluorescence from chlorophyll in a fresh leaf will be observed. Other prepared biological samples (mouse brain section, various fixed tissues of different diseases, etc.) will be also available for experimenting. Advanced imaging techniques such as tiling/stacking will be introduced if time allows. A sensitive spectrometer will also be available to acquire the optical spectrum of the nonlinear optical emission from samples. Participants are encouraged to bring a notebook. A laptop computer would be helpful to view, store and display multiphoton images. Please feel free to bring your own samples that you want to image with the multiphoton microscope. The laser power level used is generally considered safe but laser safety glasses for laser light at 1040nm nm and 1550 nm will be available. 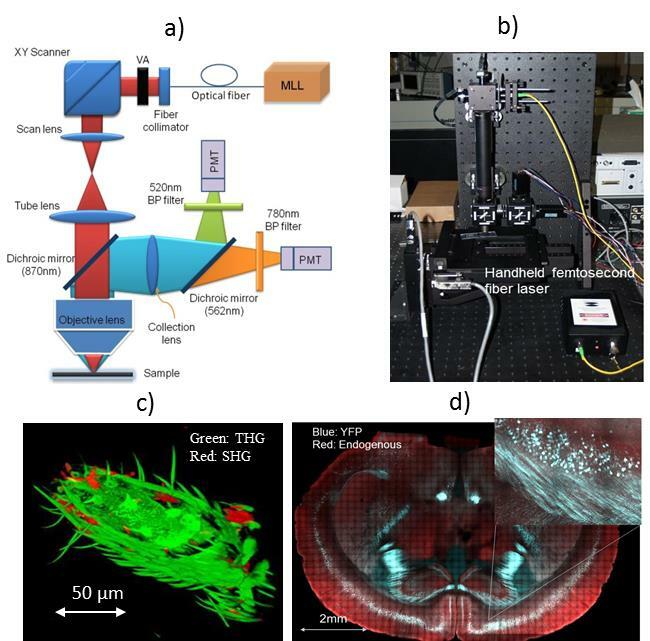 A basic multiphoton microscope described here can be constructed for approximately $10,000 (not including the femtosecond fiber laser which is commercially available at the cost of ∼$10,000). A research grade microscope will cost around $30k using state-of-the-art new components that are commercially available. For comparison, a basic commercial multiphoton microscope would cost over $500,000.